Propaganda value aside, why is Israel attacking Hamas in Gaza today? Hamas (Islamic Resistance Movement) is considered a terrorist organization by much of the non-Arab international community including the the European Union, the U.S., Canada, Japan, the U.K., Australia and Israel. Its declared goal is to destroy the Jewish state and replace it with an Islamic one. Indeed, its enmity is directed not only toward Israel but toward Jews in general. Hamas has deliberately targets Israeli civilians and endangered the welfare of Palestinians. After the Hamas/PA “unity government” signing, Hamas deputy chief Musa Abu Marzouk, immediately insisted that despite the agreement with the American and Saudi funded PA, Hamas would not recognize Israel’s right to exist. Then Hamas leader Khaled Mashaal himself declared that “the only campaign we have is against Israel…Our common enemy is Israel. Israel must be fought through force and diplomacy.” All this in 2014…..
Israel is pressured by the European Union and America to make concessions and give up territory to a terror group whose very reason for existence is suspect. While Hamas’ distaste for a legal Jewish state in the Middle East is palpable and on the record, there are excellent reasons, apart from their rocket attacks on a sovereign state, why Hamas in Gaza should be curbed. 1) Hamas completely rejects a Jewish state. 2) Hamas’s ultimate mission–”no matter how long it takes”– is to “fight the Jews and kill them” and to replace the Jewish state with an Islamic caliphate. Hamas Charter, Article 9 states: “[The goals] are to…defeat [the Jews] so that…the [Muslim] call for prayer will ring out announcing the rise of the rule of Islam, so that people and things shall all return to their proper place. 3) Hamas’ enmity is not directed against Israel alone but against the Jewish people as a whole. Jews are demonized repeatedly in Hamas’ governing document. 4) Hamas (and the Palestinian Authority) regularly incite “Palestinians” to violence. 5) The language of violent, racist confrontation and zero-sum rhetoric regularly inflame “Palestinian” passions. “The Zionists – I swear to you, by God, by the world… We will not recognize Israel. 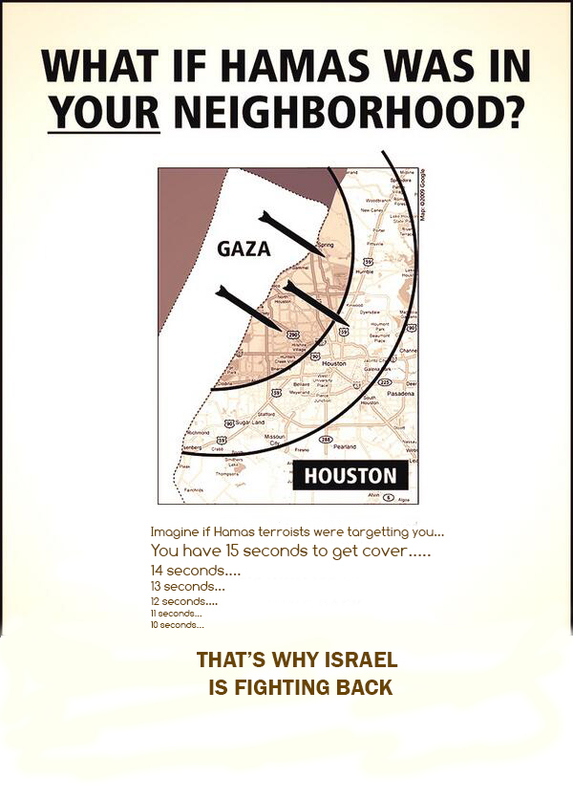 If you want security or peace, you should go back to where you came from.” (Hamas “message” to the Israeli people: Broadcast Jan. 11, 2009). “The day will come, within several years, when this world will change, submitting to the Arab Islamic will, Allah willing.” (Hamas leader Khaled Meshaal, Al Jazeera TV, October 12, 2008). “The approaching victory, about which we are talking, is not limited to Palestine…Why? Because Allah has chosen you to fight the people He hates most – the Jews. Allah said: “You shall find the worst enemies of the believers to be the Jews and the polytheists….Therefore, the reward of our martyrs is great, and your reward is also great.” (Hamas MP Fathi Hammad, Hamas Al Aqsa TV, Sept. 8, 2008). “The annihilation of the Jews here in Palestine is one of the most splendid blessings for Palestine. This will be followed by a greater blessing, Allah be praised, with the establishment of a Caliphate that will rule the land and will be pleasing to men and God.” (Hamas cleric Muhsen Abu ‘Ita, Hamas Al-Aqsa TV, July 13, 2008). And these are only the recordings we know about. Over time, words like these create a pervasive and deadly cultural poison and “national” narrative…..
6) Hamas’ targeting of Jewish civilians is deliberate policy. Today’s ongoing rocket attacks against random Jewish civillian population centres is proof enough of that. Since September 2000, Hamas has carried out hundreds of attacks targeting civilians. • Port: Ashdod Port, March 14, 2004: Hamas double suicide bombing at Ashdod Port which killed 10 people and wounded 16. • City buses: Hamas has carried out numerous attacks on Israeli commuters: more than 18 attacks on or near civilian buses, bus stops, train stations and taxis. • two suicide attacks targeting city buses on Be’ersheva’s main street, killing 16 and wounding over 100 people. Abduction: Hamas claimed responsibility for the abduction and murder of Israeli businessman Sasson Nuriel. • Shopping mall: Hamas claimed responsibility for suicide bombing at a shopping mall which killed one woman and critically wounded her husband, as well as 38 more people. A Hamas statement following the event urged more such attacks. • Rocket and mortar attacks: Hamas consolidated its control over the Gaza Strip and enabled Palestinian terrorist organizations both to expand the facilities that manufacture rockets inside the Gaza Strip and to smuggle rockets into Gaza from Egypt. Rocket and mortar attacks soon became the main method of attack emanating from Hamas-controlled Gaza. Since 2005, 5,700 rockets and mortars were fired into Israel (more than 3,500 rockets and 2,200 mortars), killing 14 civilians and one soldier. In addition, hundreds of people were wounded, and thousands were treated for shock of minor injuries. In 2008 alone, 3,500 rockets and mortar shells landed in Israeli territory (almost 2000 rockets and 1,642 mortar shells) and put almost 1 million Israelis (i.e. 15% population) into rocket range. On 8th July 2014, more than 100 rockets hit Israeli civillian targets in urban population centres. By 9th July, 2014, more than 3.5 million Israelis sleep in or near bomb shelters in event of ongoing Hamas rocket attacks in blatant breach of the 4th Geneva Convention. 7) Hamas rejects compromise, peace negotiations or a diplomatic end to the conflict. [Peace] initiatives, the so-called peaceful solutions, and the international conferences to resolve the Palestinian problem, are all contrary to the beliefs of the Islamic Resistance Movement (see above). 8) No Hamas representative has ever renounced the charter calling for the killing of Jews and destruction of the State of Israel. That mission is still being carried out today. This entry was posted in Arab violence, deny right to exist, destruction of Israel, Muslim Antisemitism, terror and tagged anti-semitism, delegitimisation campaign, demonisation of Israel, State of Israel, terror on July 9, 2014 by Alan in Australia.